Viola Desmond’s activism is an exciting part of history that we have learned more about recently, in no small part because of your beautiful storybook. Was this a new story for you? I first learnt about Viola Desmond when I was working as a Librarian at the Toronto Public Library. I was one of the caretakers of the Rita Cox Black and Caribbean Heritage collection so I was always on the look out for information and resources by and about African-Canadians. I stumbled upon Viola’s story online and thought it was really inspirational. Can you talk about how this story might have been hidden in history? It’s interesting that the Viola Desmond story was so little known for so long. Viola’s story is, in some ways, similar to Rosa Parks’ and yet if you walked up to the average Canadian, most of them would have heard of Rosa Parks but wouldn’t have the slightest idea who Viola Desmond was. And Viola’s story happened 9 years before the Parks one! I think there’s a few factors playing into this. One is that Canada has typically liked to position itself as the inclusive, tolerant nation in juxtaposition to America and its history of racial violence. You see this, for example, in the way the Underground Railroad story of Canada as a safe haven is repeated often and well known, while the fact that slavery existed in Canada is virtually unknown. And of course thinking of Viola’s story, we imagine racial segregation as something that happened in the US but in fact it was widely practiced in Canada as well. Up until the early 1950’s there were restaurants, theatres, public transportation lines, labour unions, cemeteries and social clubs across the country that would not allow black Canadians in. The other issue is that I’d say we’re not very comfortable talking about race and racism in Canada. They’re actually much more upfront about it in the US. This is reflected in Viola’s experiences where the judges reviewing her case refuse to take up the real issue of racial segregation and instead focus on the allegation she didn’t pay the right ticket price. Or you can see how for a long-time Canadian institutions’ resisted collecting statistics on race – ironically sometimes using the argument that to do so would be racist – and yet it’s only as they’ve begun to collect such statistics that we’ve been able to uncover racial inequities. A study in 2005 by the Kingston police for example, found their officers were 3.7 times more likely to stop a black person than a white person and when the Toronto District School Board was mandated to collect race statistics in 2006/2007 they found black students were 3 times more likely to be suspended than white students. Having these kinds of statistics and being open to having frank conversations about racism are critical if we want to move forward towards racial equity. It’s actually been great to share Viola Desmond Won’t Be Budged! with kids because they’re actually more comfortable talking about race that many adults are. What are people’s reactions to learning about her story and courage? The response to the story has been really positive. Kids in particular are impressed with Viola’s courage – they’re interested in imagining themselves in her situation at a movie theatre and wondering what they would do. And the idea that one single person can make a tremendous difference really inspires people. It seems like Canada was ready to hear this story because all these things just started happening right around the time the book came out – Canada Post released a Viola Desmond stamp and the Nova Scotia government gave Viola Desmond a Royal Pardon, a legal document stating she was wrongly convicted. Why did you choose to write about Ms. Desmond? 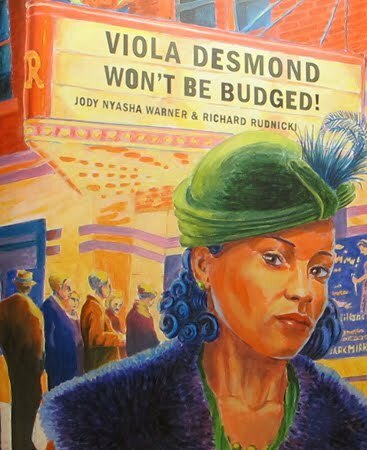 Cover of the moving and beautifully illustrated book Viola Desmond Won’t be Budged!. For information on how to order a copy, click here. And finally, to read a blog that COPA published on Viola Desmond in 2013, click here. 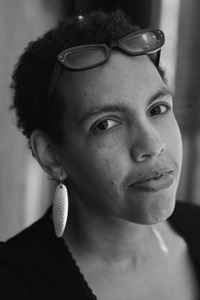 IN APRIL 2014, LOOK FOR JODY NYASHA WARNER’S NEW ILLUSTRATED STORYBOOK SERIES, CREATED IN COLLABORATION WITH COPA, FEATURING THE CAPSULE FAMILIES.